Two North Texas storm chasers were in Tushka, Okla., when a deadly tornado hit Thursday night. Erik Fox, of Denton, and Aaron Estman, of Euless, have been chasing storms together for years, reporting what they see on the front lines of severe weather to the National Weather Service. "We went to the town of Tushka, and it was gone," Fox said. "That's an eerie feeling when you pull up and what used to be a town is rubble." Tushka is just north of Durant. 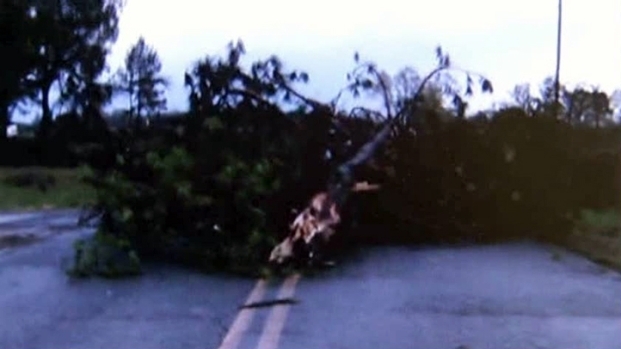 Two North Texas storm chasers were in Tushka, Okla., when a deadly tornado hit. The string of tornadoes touched down just a couple of miles away from their vehicle. They go through about 80 hours of classes each year to make sure they chase safely and accurately, but they said nothing prepared them for the aftermath. Fox and Estman pitched in to help first responders search for survivors in the rubble of a collapsed home. "It was a mobile home that had actually collapsed," Fox said. "At the time, there was one EMS person there and one police officer, and that was it." Fox, a former firefighter, and Estman helped in any way they could. "They were searching for people, and we had one confirmed dead on the scene and one critical," Estman said. "We found the other person under the rubble who was also dead." The two said the incident reminded them of why they chase storms and why they will continue to do so. "Because without our warnings, along with the help of the National Weather Service, these people wouldn't have had a warning, and there would have been a lot more death than there was," Fox said. At least 17 people were killed in the severe storms that later moved in Mississippi and Alabama, including two elderly sisters in Tushka. The same storm system dropped hail on North Texas on Thursday night and spawned an EF-0 tornado in the town of Honey Grove in Fannin County.